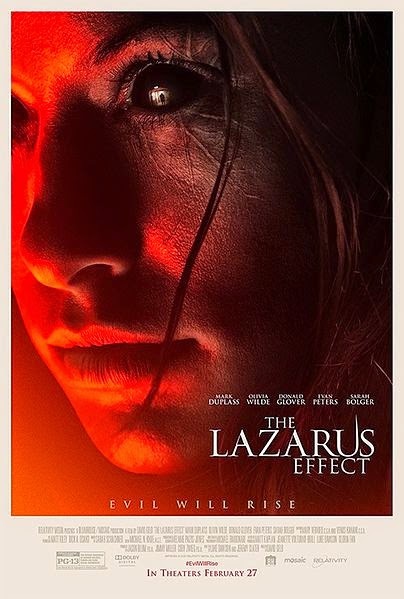 The Lazarus Effect is an upcoming American horror film directed by David Gelb and written by Luke Dawson and Jeremy Slater. The film stars Evan Peters, Olivia Wilde, Sarah Bolger, Mark Duplass and Donald Glover. The film is scheduled to be released on February 27, 2015, by Relativity Media. A team of medical students have found a way to bring dead patients back to life. When Zoe (Olivia Wilde) dies, they attempt to duplicate the procedure that was done on animals on to her, and succeed. But is it really Zoe that has come back? Or something else? Something evil.